Amar, Akhil Reed. In the Beginning. America's Constitution: A Biography. New York: Random House. 2005. ISBN 978-1-4000-6262-1. Edling, Max M. A Revolution in Favor of Government: Origins of the U.S. Constitution and the Making of the American State. Oxford University Press. 2003. ISBN 978-0-19-514870-1. Ellis, Joseph. 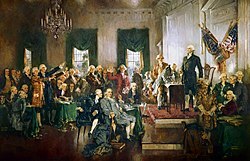 Founding Brothers: The Revolutionary Generation. Vintage. 2002. ISBN 978-0-375-70524-3. Fallon, Richard H. The Dynamic Constitution: An Introduction to American Constitutional Law. Cambridge University Press. 2004. ISBN 978-0-521-84094-1. 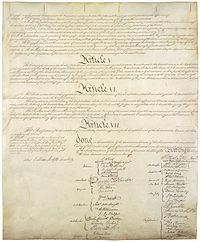 Farris, Michael P. Through the Founders' Eyes: Was the Constitution Illegally Adopted?. The Home School Court Report. July/August 2005, 21 (4): 6–10. 请检查|date=中的日期值 (帮助) excerpt from (to be published) Constitutional Law for Enlightened Citizens. Hall, Kermit L. A Comprehensive Bibliography of American Constitutional and Legal History, 1896-1979. Millwood, N. Y.: Kraus International. 1984. ISBN 978-0-527-37408-2. Kammen, Michael. 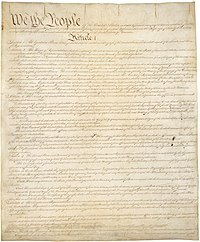 A Machine that Would Go of Itself: The Constitution in American Culture. New York: Alfred A. Knopf. 1986. ISBN 978-0-394-52905-9. Mazzone, Jason. The Creation of a Constitutional Culture. Tulsa Law Review. 2005, 40 (4): 671. Smith, Jean Edward; Levine, Herbert M. Civil Liberties & Civil Rights Debated. Englewood Cliffs, New Jersey: Prentice Hall. 1988. Smith, Jean Edward. John Marshall: Definer Of A Nation. New York: Henry Holt & Company. 1996. Smith, Jean Edward. The Constitution And American Foreign Policy. St. Paul, MN: West Publishing Company. 1989.